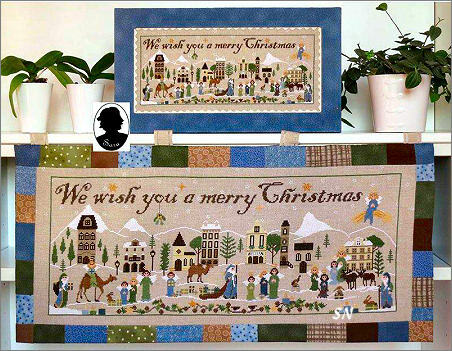 By Sara Guermani... we have two new Christmas designs -- this is just one of them. An endearing Christmas Village -- Downtown -- Christmas Eve ceremony... everything is layered out for the arriving 3 Kings. 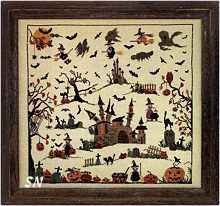 Overall stitch count is 354 x 140 - so a whopping 19 x 9 on 32ct. 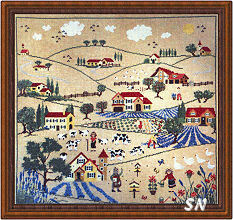 Charming landscape, cute figures coming for the festivities... presented as a chart. By Sara Guermani, this is cute! 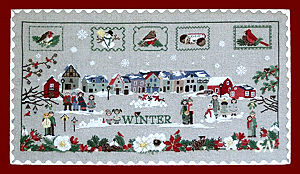 A city scene... complete with row of (dark?!) 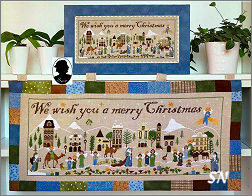 houses, carolers and snow-man-builders, the 5 individual boxes of motifs at the top, and the cute things inside of them!! One of 6 additions to our Sara Guermani page, this is super cute! 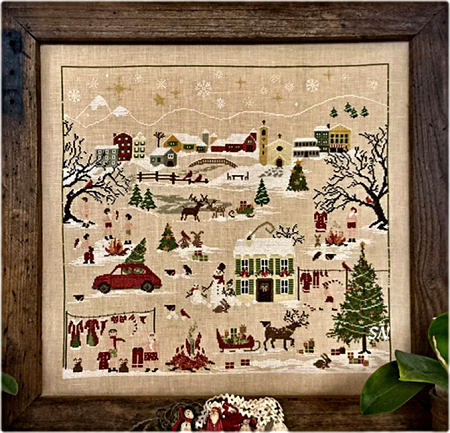 Everyone has left all the Christmas chores till the 11th hour! The family Christmas tree is there in the car... BOTH the elves and Santa are doing their laundry with water heated on the fire! You can see everyone waiting around in their shorts! (Santa's are red polka dot, of course!) and... there are reindeer delivering wrapped packages on sleds. 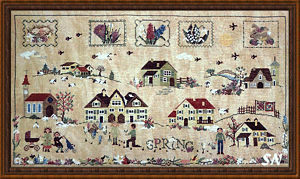 Finishing about 17 inches square on 32ct... all of these in this series make into REALLY NICE substantial couch pillows. Festive decorations to bring out every year -- just for a special few weeks! Coded for DMC, but she's easy on you this time - only 19 shades! 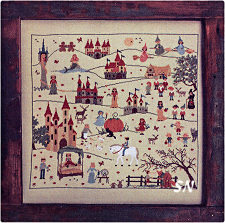 By Sara Guermani, this is a charming hillside scene stuffed full of Fairy Tales! (Kind of like all the Castles grouped together on the Rhine!) I see Rapunzel, Sleeping Beauty's three mothers, The Princess & The Pea, the Knight on the shiny white horse... all sorts of things. It makes you research your fairy tales a little to figure out who they all are! Anyway, charming, it measures 278 x 263 and calls for 36 different DMC flosses. 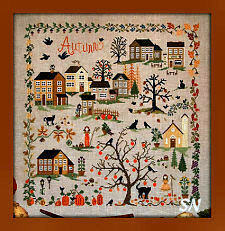 A pretty piece, this has NO Halloween elements in it... strictly Autumn in color and subject. I love the different borders, there are golden orange evergreens in here (so they must be different trees than evergreens!) and gorgeous little cottages and houses scattered about. 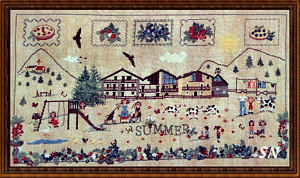 Lots of smaller scenes to pull out of here and stitch if you need something smaller. Calls for 60 different DMC flosses, the chart comes with a wooden black cat button -- which you can see near that lower right hand corner. 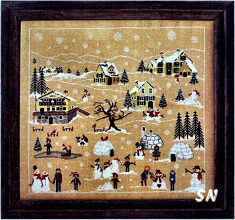 This is a charming chalet scene teaming with cute little sheep. They're hopping everywhere, having the best time! Measuring 207 x 176 -- they are stitched on a medium pink-red linen -- we suggest Weeks Dye Works Red Pear (30 or 32ct) hand-dyed. It's a perfect choice for this! 22 DMC's called for, even just the chalet with a few sheep would be darling! 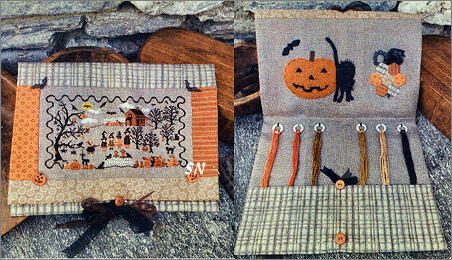 This is a chart for a cute little Halloween sewing case. 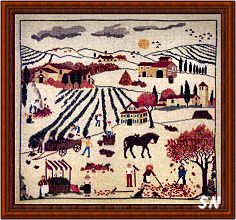 259 x 138 in stitch count, fabric count will determine finished size. 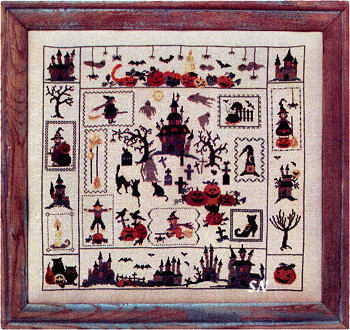 There are english instructions and some pictures for the finishing process, and the chart comes with four wooden buttons -- 2 flying bats and 2 jack-o-lanterns. 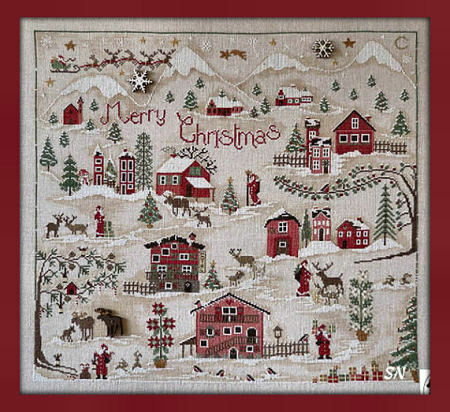 Ski slopes and lots of snow-trimmed evergreens, this measures 280 x 262. Uses 40 Different DMC shades; a small wooden fence and lamp post button is included. 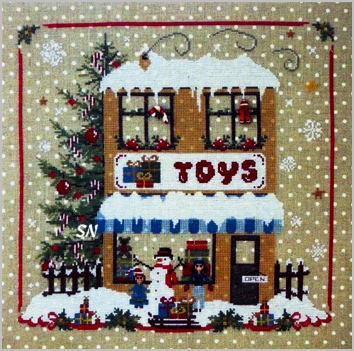 Neat border on this one! Spring and Summer in the countryside! Sara Guermani has two charming village scenes that are full of houses, flowers, farm animals, quilts on the line, and small scenes scattered everywhere. 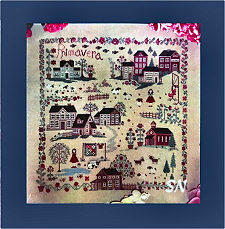 Measuring 280 x 263 in size, these finish approx 20 inches square on 28ct, or 15-1/2 inches square on 36ct. Coded for DMC floss, ESTATE uses 62 different shades, while Primavera uses only 40! 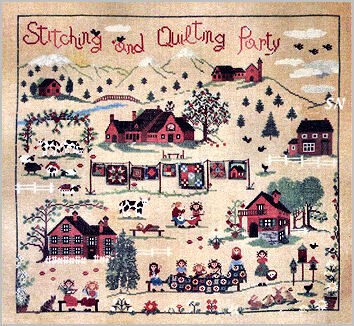 Super fun to look at, you'll keep noticing details everywhere, which makes them even more fun to stitch. 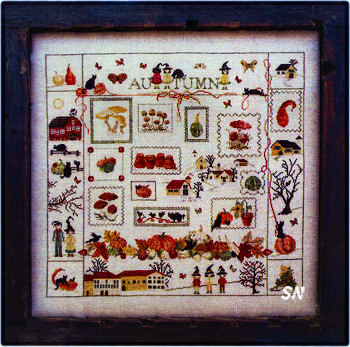 Each chart comes with a wooden button embellishment that has been hand painted. Geese in Estate, and sheep in Primavera. 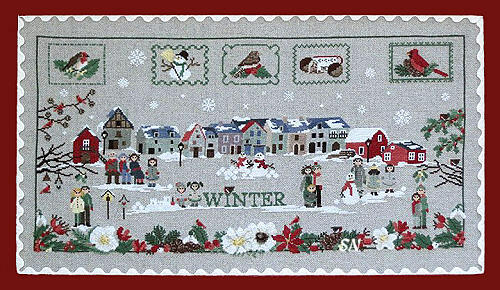 This snowcovered village is getting ready! Reindeer everywhere, little people with long, striped stocking caps and curly-tipped boots, tree trimming is going on in the lower right corner. Charming! 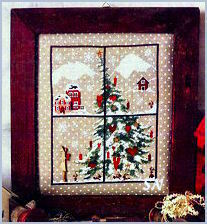 Buttons include a red barn and two wooden stars. Only 31 colors in this one. The little chalets in this one are so cool! Santa and his reindeer are up there in the sky, there are deer and Olde Worlde Santas all over in here! All the little trees, all the rolling hills, as with all of these, you just want to be in the middle of them all!!! 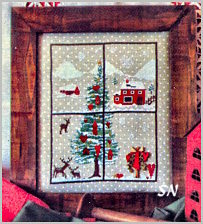 Buttons included are a pair of snowflakes and a moose. Only 21 different colors in this one! 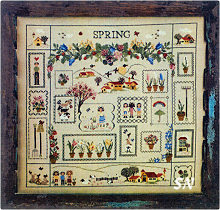 Pretty borders and small scenes are scattered amidst the houses and floral blocks of these seasonal pieces. 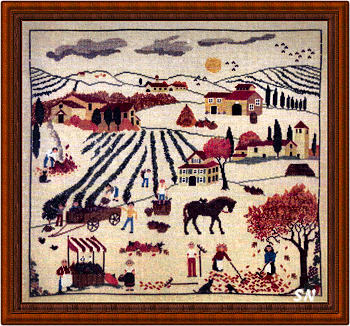 Each measures a whopping 360 x 190 in stitch count -- or 20 x 11 on 18/36ct. Kind of large... so if you don't want that whole thing, break apart the design elements and use your favorites. The Spring houses are really charming. We laughed in the shop when these came in. The date is in the title... so I guess when you look at these in your stash in upcoming years... you'll know how long you've had them! (not always a friendly reminder!) Charted for approx 40 different shades of DMC floss! 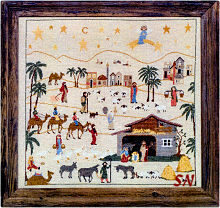 A lovely piece by Sara Guermani, this depicts the Manger Scene in the city of Bethlehem. Jesus is already born -- he's in his little crib. Three Kings and the Shepherd's are near... Angels are in the sky. 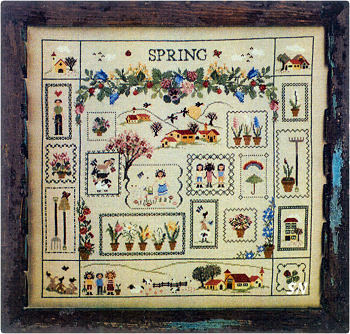 Measuring 278 x 263 in stitch count, this will finish about 17 inches square on 32ct. The picture is on a light sand color... you might want to darken that to natural or an amber color, so the sheep, geese and little pink pig show up! 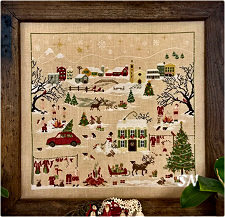 A very pretty Christmas piece... a gentle reminder of The First Christmas. 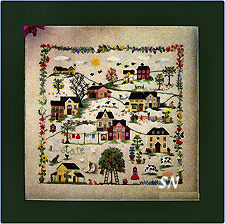 Gorgeous sprigs of florals scattered everywhere, there are tiny village scenes tossed in between as well. To the left of center there is an animal pile-up that is charming! 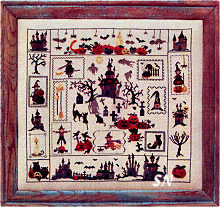 Halloween Sampler -- Lots of scary haunted castles, witches flying everywhere, and dangling spiders... this is kind of on the heavier side of halloween. 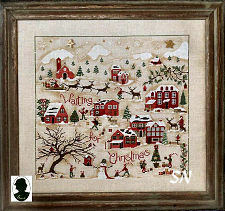 278 Stitch count... same size as the rest in this series, 20 shades of DMC are called for. 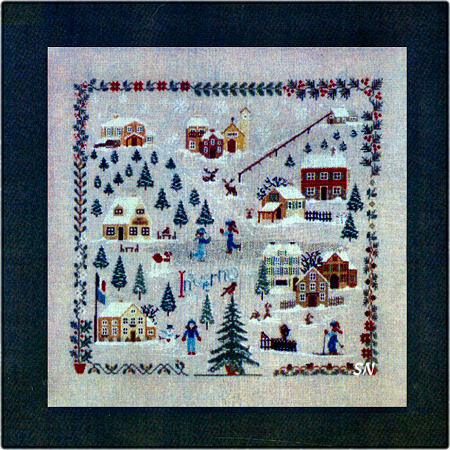 Advent Sampler -- This one is kind of fun! Each of the motifs has it's advent date number... so if you were a fantastic finisher... you COULD stitch this and make little doors out of all of them. 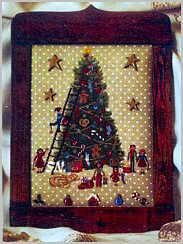 BUTTTT if not, single ornaments would be fun, and of course, the framed piece is charming presented as is! 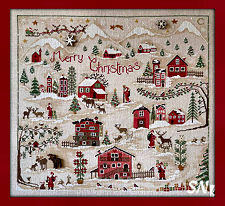 278 x 263 -- same size as the rest, choose your favorite fabric and 20 DMC flosses from your stash! 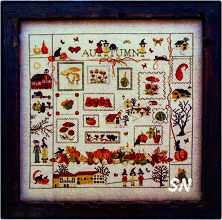 These are charming medleys of all sorts of scenes, motifs, and memories of the Summer and Autumn seasons. 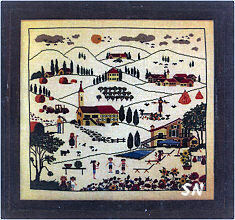 By Italian artist Sara Guermani, each is presented in chart format and designs measure 278 x 263 in stitch count. That makes them 14-ish inches square on 40ct or 19-1/2 on 28/14ct. You can choose any fabric and count you like, though, AND stitch ANY or ALL parts of each piece. 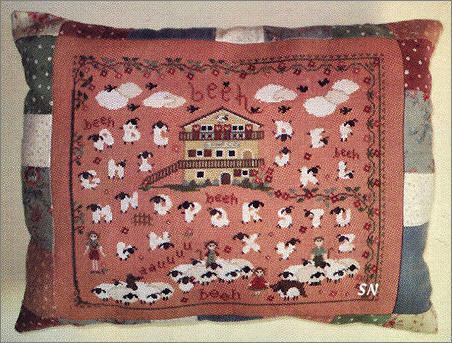 Charted for DMC floss, there are little villages and animals all over the place... and you can see how the little sections would be fun to break up and stitch individually to make smaller cushions. 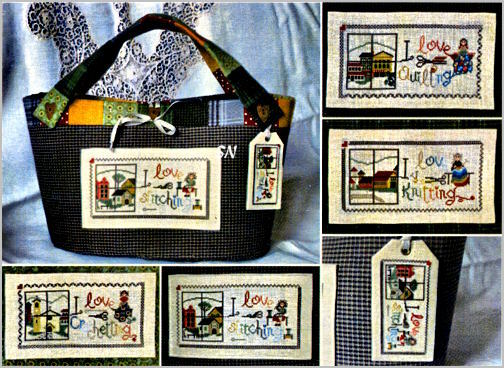 You could make a whole bundle of bitty things to nestle in a basket... or make a larger statement for your walls. 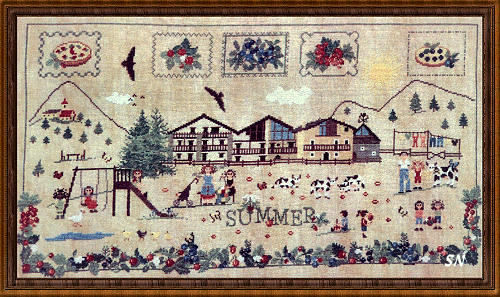 Coded for DMC floss, ESTATE uses 62 different shades, while Primavera uses only 40!Super fun to look at, you'll keep noticing details everywhere, which makes them even more fun to stitch. Each chart comes with a wooden button embellishment that has been hand painted. 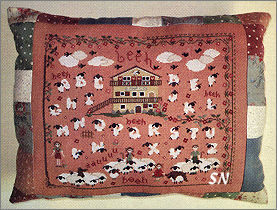 Geese in Estate, and sheep in Primavera. Two more charming scenes -- again measuring 278 x 263 each, coded for DMC flosses. If you work these on 32ct, they'll finish approx 17 x 16 -- quite generous in size. 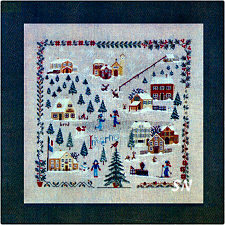 Regular Crosses, with a few French Knots and bits of backstitch. Just lovely... imagine a spectacular custom framing treatment on them... mmm! Not a very exciting name for this set of designs -- BUT they ARE cool! 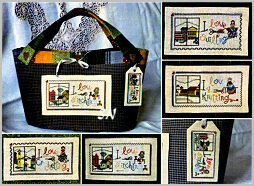 This is a set of charts that says 'I love Stitching, Crocheting, Quilting, and/or Knitting. One chart for each thing. Measuring approx 70 x 140 in size -- 4 x 9-ish on 32ct... they are coded for DMC floss. 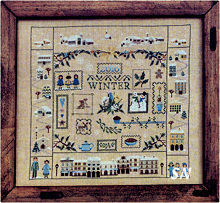 Each has the wording, a lady doing her craft, and then a window scene. I am not sure what the window scene has to do with what you are doing (other than the fact that you are taking a break and looking out the window!) but those scenes are charming... and you can interchange them, leave them totally off, or stitch THOSE and forget the other half! Kind of odd... and a bit on the pricey side...but hey, you'll figure out something! Wouldn't this be a totally fun day??? 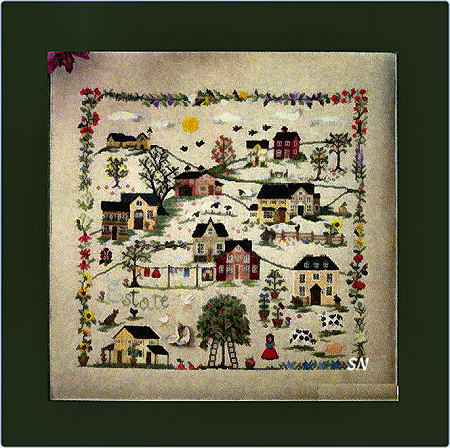 One of Sara Guermani's larger landscape scenes -- measuring approx 17 inches square on 32ct -- everyone is having a wonderful time stitching and quilting... the houses all match... the animals are all happy, the landscape is organized and varied... it's just a fun little scene! Coded for millions of colors of DMC (well only 32), the chart includes a 3/4 inch square wooden button with the classic house design on it. 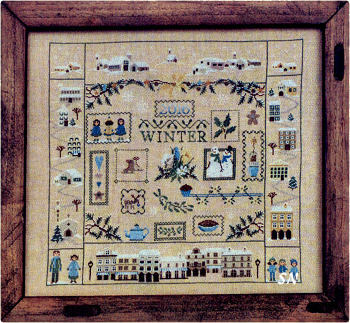 It's the 'quilt' on the far right hanging on the clothesline close to the center of the piece. 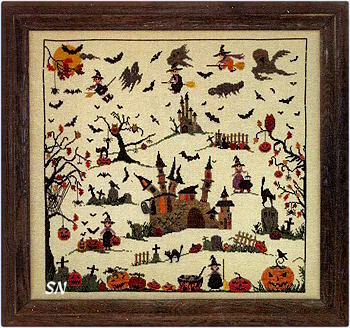 Another of Sara's 'landscape' scenes... Halloween measures about 17 inches square on 32ct -- the same as all her other scenes. 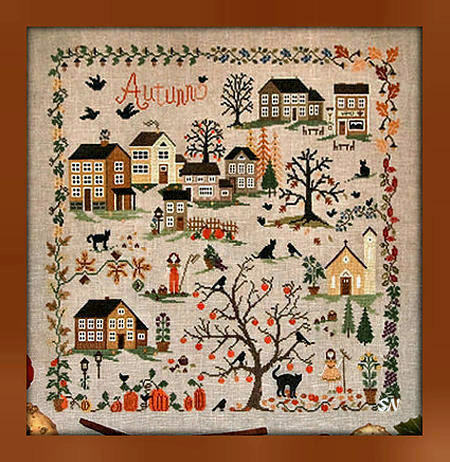 This one -- just like all the rest -- has great smaller motif areas you can grab out and stitch individually, but together, this gives you a busy scene full of great color, lots to see, and charming design elements. The ghosts are neat, the little cauldron at the bottom is kind of fun, LOVE that messy spider web in the tree, and actually that moon in the upper corner is neat with leaves in front of it. 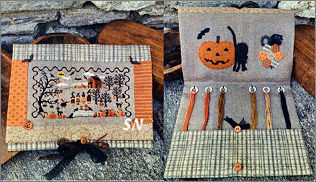 Coded for DMC floss, the chart comes with 4 wooden buttons -- a ghost, bat, spider body and scared cat. SUPER cute! Quite a festive toy shop awaits Christmas Shoppers, only they better shovel so you can reach the front door!!! Designed by Sara Guermani, this is stitched on 32ct Natural Belfast linen that has white polka dots printed on it. (looks like the falling snow.) The building is festive and the gigantic tree is even better! 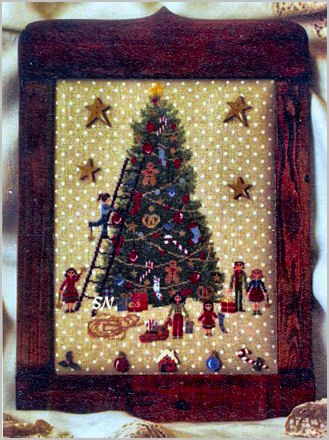 Finishing approx 11 inches square, the chart is coded for 22 colors of DMC floss, and includes a pair of wooden buttons -- 5/8 inch candy cane and gingerbread man, who are featured up in the second story windows. Try adding some opalescent filament to the white snow, or maybe some red in the tree ornaments?? 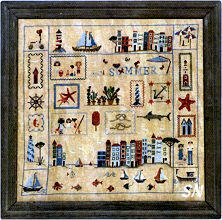 A pair of similar designs, these are stitched on 32ct Natural Polka Dot Linen with DMC flosses. 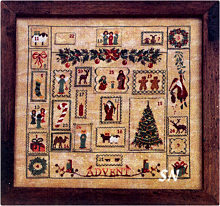 Each measures 8 x 10, and features a wooden 2-1/2 inch cut-out angel button in the design. The trees in these are the focal point, to me... the wooden angels are darling... but you could use those on something else, and these pictures wouldn't miss them. So DOUBLE USE out of these charts! 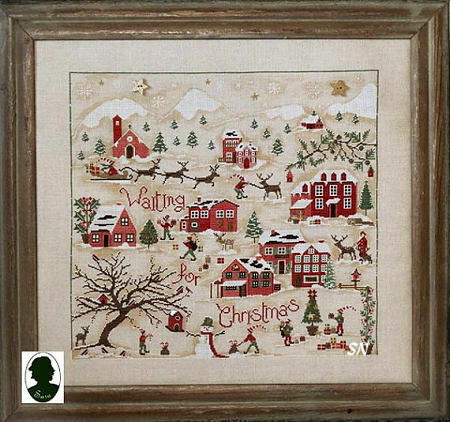 Another fun Christmas design stitched on the polka dot Belfast 32ct linen, This one features a neat Christmas tree during it's decorating process. 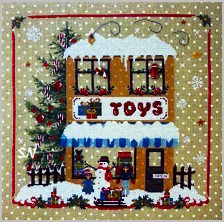 Coded for DMC floss, this finishes approx 10 x 12 -- quite large. 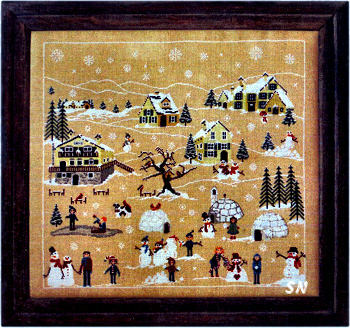 You can see stars in the background and small motifs along the bottom in the pic. Those are buttons that are NOT included in the chart. I don't know anything about them... except to say that you could use that as design inspiration to add some of your own. I don't think you'd miss them if they weren't there. I don't know why this chart is so expensive either... probably was supposed to come with those darn buttons... so I'm cutting the price from $34 to $18!